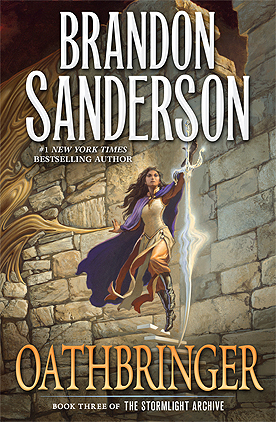 Description: The eagerly awaited sequel to the #1 New York Times bestselling Words of Radiance, from an epic fantasy author Brandon Sanderson at the top of his game. Nestled in the mountains high above the storms, in the tower city of Urithiru, Shallan Davar investigates the wonders of the ancient stronghold of the Knights Radiant and unearths dark secrets lurking in its depths. And Dalinar realizes that his holy mission to unite his homeland of Alethkar was too narrow in scope. Unless all the nations of Roshar can put aside Dalinar’s blood-soaked past and stand together–and unless Dalinar himself can confront that past–even the restoration of the Knights Radiant will not prevent the end of civilization. Brandon Sanderson is an author who never ceases to surprise me. The first book of his I read was ‘Elantris’ many years ago, and to be quite blunt I didn’t like it. I skimmed it after I got bored, and barely finished. I skipped tens of thousands of words, dozens of pages in Elantris… and lost almost none of the book’s content in the process. At the time I thought the book Elantris was, quite simply, mostly empty. Looking back on my previous experiences with Sanderson and this, I am honestly amazed with how much he has improved as an author. ‘Oathbringer’ somehow managed to be even better than ‘Words of Radiance,’ catapulting the Stormlight Archive into my top three favorite series of all time. In the past I would have said that Characterization is not Sanderson’s strong suit. That is no longer the case. Sanderson, somehow, has achieved the Triple Crown of Characterization, Plot and Pacing, and has achieved it consistently. He is a master of his craft. The characters in this book specifically are amazing because of their flaws. Even minor characters struggle with their flaws innate to their personalities. About their flaws: Shallan is amazing at everything she turns her hand to because she has schizophrenic alternate personalities which are great at those things. Dalinar aspires to be a noble leader of men in a time of great need- only to have the consequences of his prior life choices catch up with him, and those consequences are constantly kicking the feet out from under his leadership. Adolin struggles with the fact that he has slain a man in cold blood, even though in many ways he is what his father aspires to be. Even lowly Teft the soldier fights with his drug addiction so as to become an active member of Bridge 4. These characters don’t wallow in their misery, but transcend it. They embrace their pain and are empowered by it. I can safely say the characterization is so strong as to rip your heart out and have you the reader weep bitter tears for the loss of it. Honestly the plot and pacing of this book weren’t it’s strongest feature. Both were strong, even very strong in places, but they played second fiddle to the mental foibles and failures of the Knights Radiant. Indeed I thought the book lagged towards the middle. I didn’t like the Kholinar Cultist plotline which occurred halfway through the book, for example, or the near-absence of Shen/Rlain scenes. High recommended- but start reading with ‘Way of Kings’ first. This is Sanderson’s best work yet. I hate to say it but I think I just read my favorite book of the year 2018 already. It’s hard to imagine that I’ll be reading something better after this. Stay Sunny- and Unite Them.